When it comes to relaxation, Tregini knows how to really get your mind and body completely entranced in peace. What could be better than a relaxing bath after a long day of work reading your favorite book or watching your favorite television show all while sipping on a glass of wine? With our extendable bathtub caddy you're on your way to great times to soak all your troubles away! Closed Dimensions: 27.5" x 9"
Extended Dimensions: 41" x 9"
A nice hot bath is the only time you actually get to get privacy after a rough day. Now you can reap the physical benefits of a nice bath while enjoying your favorite book or movie comfortably with our bathtub caddy! It's professionally crafted to fit most standard bathtubs and even includes a convenient extending feature that can extend to fit larger tubs. Use it to hold books, tablets, and phones in your bathtub without worry of them getting soaked! It can also be hold bath products including soap, lotion, salts, bubble solution, shampoo and more! Flip down the reading rack, put out a few candles and surprise a loved one with a romantic at-home spa session! Enjoy leisure and free time with the peace of mind that your accessory is made from premium eco-friendly bamboo! All natural material that's both rustproof and waterproof for maximum performance! A bathtub caddy is something anyone would love to get so give the gift to comfort with us! 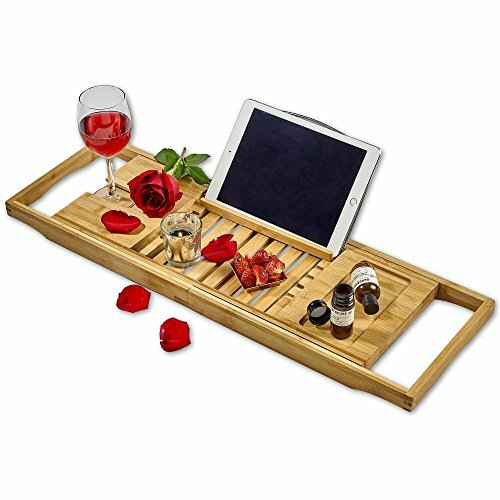 Extremely elegant composition, wide array of usage, and unmatched durability ensure that anyone you present this with will absolutely love it! Great for birthdays, holidays, and festive occasions! PERSONAL SPA IN YOUR OWN HOME: Transform a regular bubble bath into a luxurious spa session right in your home with this luxury bathtub caddy so you can comfortably enjoy a book, movie, wine and more! 100% PREMIUM BAMBOO WOOD: Professionally crafted with high quality waterproof and rust proof materials to ensure unmatched durability and long-lasting use. Better yet, the wood is eco-friendly too! HOLDERS FOR ALL YOUR MUST-HAVES: No matter what you would like while you relax in your bath, our caddy can support it - there's a book or tablet rack for reading, a wine glass holder, and a smart phone slot. CONVENIENTLY EXTENDABLE: This tray extends from 27.5" to 41" and is universally compatible with most bath tubs. Just pull along the sides as far as you need to get to the perfect size to relax comfortably. GIVE THE GIFT OF RELAXATION: From Mother's Day to Father's Day, birthdays, holidays or romantic anniversaries, this one person or two person caddy makes an awesome luxurious present for men or women! If you have any questions about this product by Tregini, contact us by completing and submitting the form below. If you are looking for a specif part number, please include it with your message.